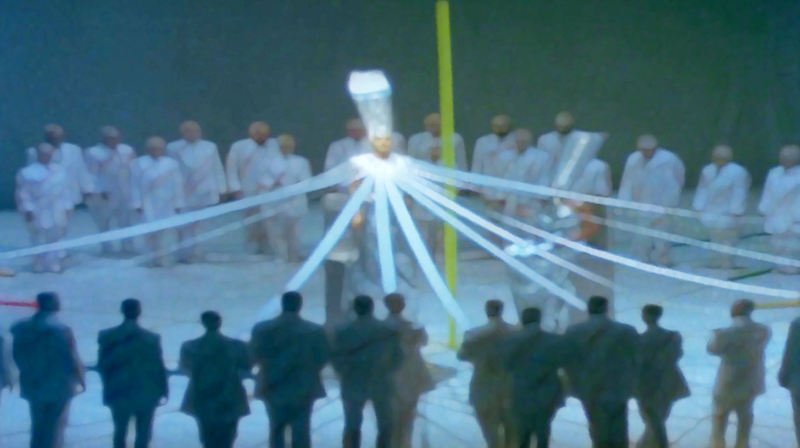 Countertenor Paul Esswood performs Akhnaten’s Hymn To The Sun in German in Achim Freyer’s original 1984 production of Philip Glass’s Akhnaten. Saw this years later in the old “Flughafen Tempelhof” hangars. Left a deep impression on me. Update 6. January 2016: The version mentioned above has vanished from the web. It’s a great recording and I hope to be able to relink it one day. If you ever get your hands on it… watch it. In the mean time I linked this post to another version. Update 26. July 2016: Found the documentary that contained the original version to “Hymn to the sun”. You can see that part in a dedicated blog posting to the said documentary towards the end (paid content at Vimeo).